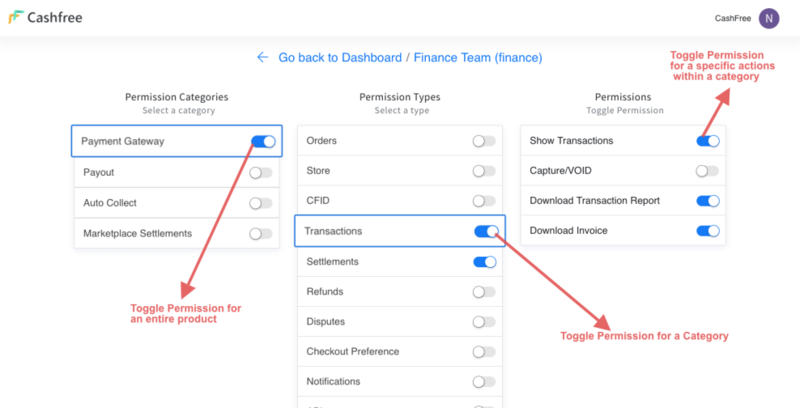 Our new User Management feature aims to give account owners complete control over user actions within the Cashfree Merchant Dashboard across all Cashfree products. When you create a new account on Cashfree, you begin as a single entity which has complete access to the dashboard. This is called the owneraccount in our parlance. 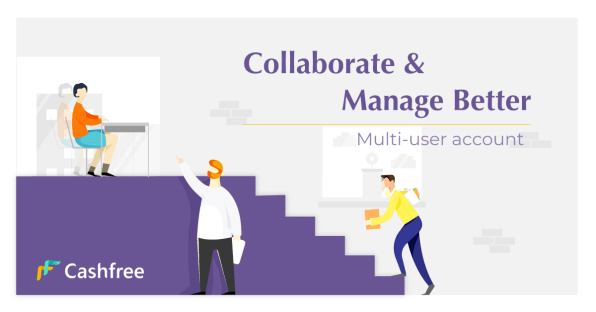 With the new User Management feature, the owner account holder can now add multiple new users for all the actions on the left side panel (as shown below) and give appropriate permissions at the individual level. 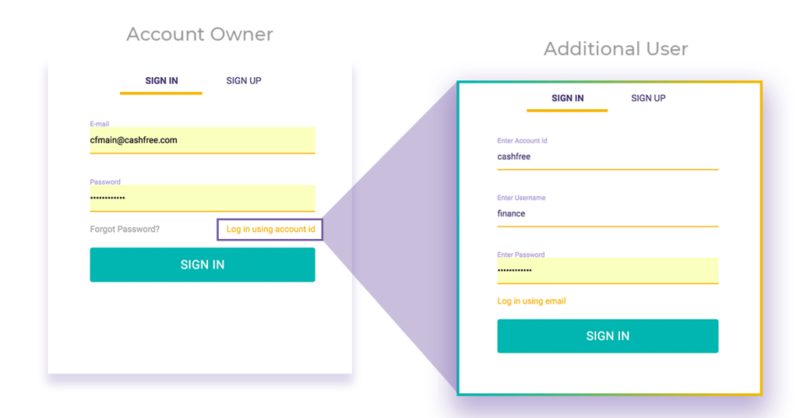 Steps to add users and set permissions by the owner. Login to the merchant dashboard, click on the top right and visit My Account > Account Aliases/Users. You can also directly visit the url- https://merchant.cashfree.com/merchant/account#addUser. Please note: If you see the message – “You do not have access to view this page”. It means you are not the owner for this merchant account. If you are the owner for the merchant account but still see this message, please get in touch with us. 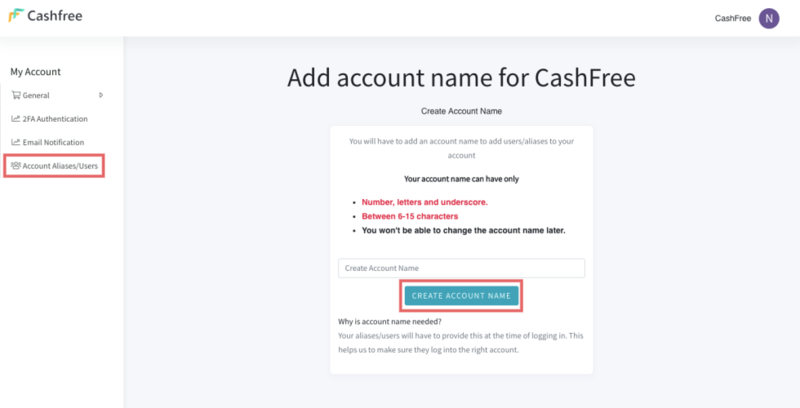 If this is your first time here, you will have to create an account name, for example, for Cashfree we use the account name cashfree. Note: Creating an account name is a one-time thing and account name once set cannot be edited later. Enter your account name and click on “Create Account Name”. Enter all the user details and set a password for the user and click on “Create alias”. Only the account owner can create/choose a password for the users. 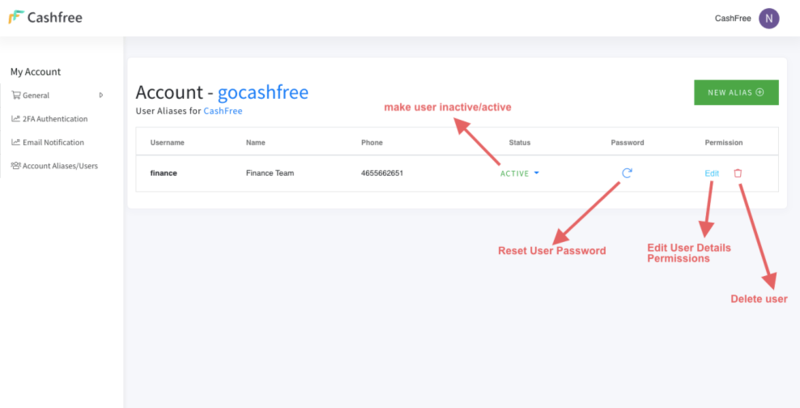 Once the user account is created, (as shown in image below) the owner can change the status as active or inactivate, reset the password or delete the user account. 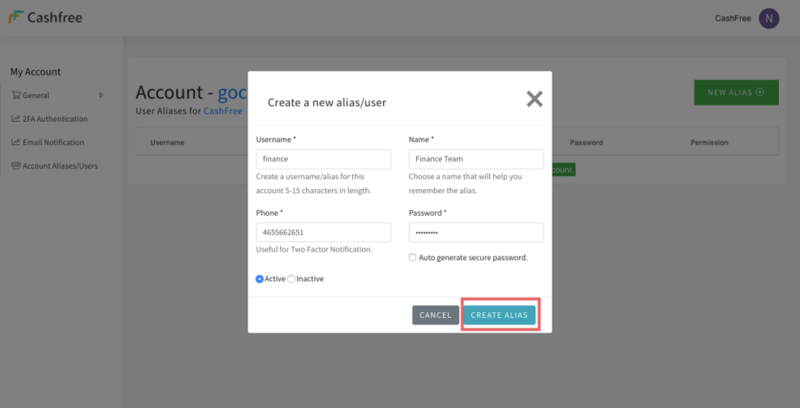 Once the user account is set, the owner can also edit user permissions by selecting the particular user and clicking on Edit>Go to Permission Page. On the permission page, you can select for which Cashfree product you are assigning/modifying the permissions, for example for this particular user, I want to give access only for the Cashfree Payment gateway. 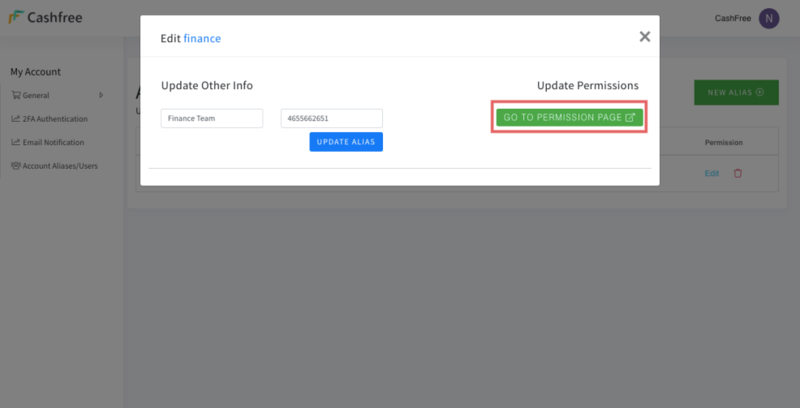 Next, you can also set the permission type, for example, in this case, permissions are given for Transactions and Settlements. 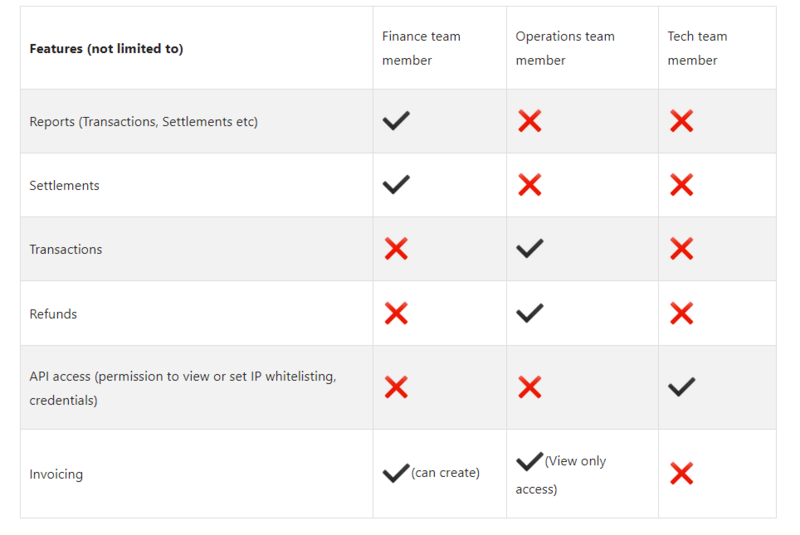 Further, you can set what type of access are you granting, for example, I want that user should get access to see transactions, download transaction report and download invoice but user should not have permission to capture/void (capture/void is only applicable for pre-authorization enabled accounts). How to login in once additional users have been added? Once user has been added, he/she can log in to Cashfree Merchant Account https://merchant.cashfree.com/merchant/login using the credentials. Please note: The account owner will be able to log in using email id and password, while the user added subsequently need to click on “Log in using account id and log in using account id, username and password”. If you need any assistance, write to us at care@cashfree.com. You can also drop us a mail if you have any suggestions or feedback.